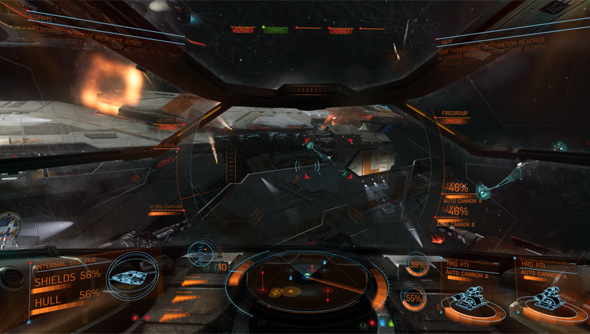 Elite: Dangerous won’t be done for a good long while yet – in this stage of alpha it’s been rated merely ‘unnerving’ – but an elite group of Kickstarter backers are already enjoying something that looks and plays an awful lot like it. Grab a fire extinguisher and propel yourself through the vacuum to the videos embedded below. Backers who’ve pledged £200 or more to the resurrected space-meanderer are playing through a test slice of the combat system. Frontier Studios have released nine single player combat scenarios, and the reaction thus far appears wholly positive. Each scenario unlocks the next after completion, and the missions rise sequentially in difficulty – so the majority of the footage found on YouTube today features the early part of the slice. The cockpit is really something to behold – a rickety mass of metal that gobbles up nearly half of your view. It follows the tilt of your head with a very slight lag – just enough to let you know that you’re in this thing, not playing the thing itself. And as the vessel takes damage, it begins to spark and set on fire for maximum panic. Special mention goes to the beeps and giddy whines of the machine around you as you pick up speed. Bliss. Then there’s the UI, melted onto the windscreen, or whatever they are when they’re in spaceships. The scanner is a 3D rendering of your environment that sits just below your view of the vacuum. Enemy ships concealed by asteroids and such are reportedly harder to pick up on your systems – so we’ll look forward to elaborately staged ambushes in the final game. Other segments of Elite will be made available in alpha next year as they reach completion, and in time will become playable to backers with slightly thinner pockets. Is that you? Or somebody you now wish you were?